Yesterday (October 28th) was the Feast of Saints Simon and Jude. 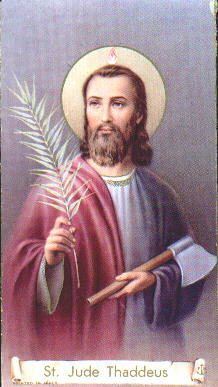 St. Jude is today most closely associated with being the “patron saint of lost causes”, which is a very recent devotional development. I’m sure many of you remember seeing the St. Jude Novena published in the classified section of the newspaper. Remember newspapers? Ah… nostalgia. Anyway, there is certainly nothing wrong with this, as I have mentioned before and am still trying to get my head around myself, all of the Angels and Saints know us personally and love us personally, and are desirous of our achieving the Beatific Vision with them. This is one of those things that if I sit and think about with any depth I still find shocking. They ALL know who I am. They are ALL rooting for me. They are ALL fully available to pray for me. The other big thing that St. Jude is famous for is writing the Epistle of St. Jude, which is the next-to-last book of the New Testament, and is tiny at only 25 verses. The book of Jude is an exhortation and warning against heresy and heretics. So, yeah. It is slightly timely. Just a little bit. Lilbit. It covers everything: heretics bringing about chaos, or as they say in Spanish, “lio” (“turning the grace of our Lord God into riotousness” – verse 4), the fact that God’s wrath has, does and will come upon heretics, and the admonition to the faithful to reprove the heretic and sinner, because this is what is demanded by charity. Do click over to DRBO.org and read the entire brief Letter of St. Jude because it is so relevant, and also read the excellent Challoner footnotes which are most helpful. Then, revisit the prayer to St. Jude above, because while it is tempting to think in these dark days that the “cause is lost” – it isn’t! I think St. Jude, given the topic of his Epistle, should be widely enjoined to pray for us, and for the Church!